Enjoy Upscale Comfort at the Crowne Plaza, Grand Rapids.Just minutes from Gerald R. Ford International Airport & to the downtown city center, the hotel is an ideal choice for both business & leisure travelers. With exceptional service and amenities, these upscale accommodations have everything you need for a memorable trip. With a Business Center and free Wi-Fi access, you'll achieve new heights of productivity. We are minutes from area businesses & hospitals such as Farmers Insurance, GE Aviation, Cascade Engineering, Steelcase, Service Express, Meijer, Spartan Stores, Spectrum Health, St. Mary's Hospital, Metropolitan Hospital & MMPC. 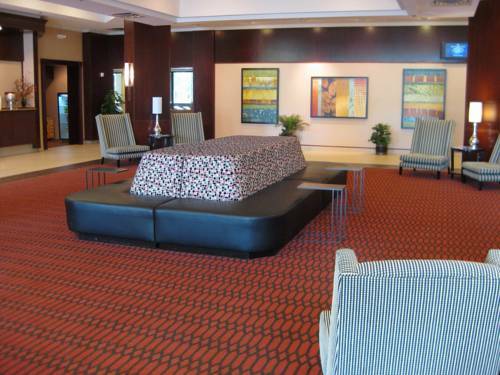 Our ideal location near the Grand Rapids Airport makes our hotel the perfect place to meet. We have more than 20,000 sq ft of flexible meeting space to host business meetings & social events. Guests can enjoy the many area attractions, including Meijer Gardens & Sculpture Park, Gerald R. Ford Museum, Grand Rapids Art Museum & Van Andel Arena. Our Crowne Plaza guests can enjoy spa services at Design 1 Salon, Cascade location. Our Grand Rapids Airport hotel provides a host of convenient perks, including a complimentary shuttle to & from Gerald R. Ford International Airport. Take advantage of our indoor/outdoor pool & a sauna, plus savor award-winning cuisine inside our restaurant & lounge. A better night's sleep awaits you with the Crowne Plaza Sleep Advantage Program. Aryana Restaurant and Bar: For a great place to unwind, Aryana Restaurant and Bar is a popular choice among our hotel's guests. In Grand Rapids, Michigan, our lounge features a full bar with various brews, fine wine and cocktails. Relax and enjoy a happy hour special. Childrens's program - Families can enjoy our large indoor/outdoor pool and whirlpool. Enjoy in room movies and child friendly menus in our restaurant. Grand Centennial Ballroom: Grand Centennial Ballroom is 4,840 square feet with 12 foot ceilings. The ballroom can host up to 570 people and can be split into 5 seperate sections. Grand River Ballroom: The Grand River Ballroom is 2,640 square feet with 12 foot ceilings. The junior ballroom can host groups up to 250 people and can section into 4 seperate rooms. Petoskey/Mackinac: The Petoskey/Mackinac room is 1,220 square feet with 12 foot ceilings. Hosting groups up to 90 people the room can be sectioned into two seperate rooms. Executive Boardroom: The Executive Boardroom features large executive leather chairs and conference table with seating for 12 people . The room also features natural light with access to the outdoors. Cascade Room: The Cascade Room is a junior boardroom that can seat up to 8 people. Salon A: Salon A is 624 square feet with 10 foot ceilings. The room can host groups up to 50 people. Salon B: Salon B is 624 square feet and can host groups up to 50 people. Salon C: Salon C is 624 square feet and can host groups up to 50 people. Salon EF: Salon EF features natural light with access to outdoor. With 1,248 square feet it can host groups of up to 90 people. Frederik Meijer Gardens & Sculpture ParkMichigan's largest conservatory can be found right here in Grand Rapids, MI. Our hotel is minutes from the Frederik Meijer Gardens and Sculpture Park, which also offers a boardwalk overlooking wetlands, sculpture galleries and an indoor Victorian Garden. John Ball ZooEndless adventure awaits you at the John Ball Zoo in Grand Rapids, MI. Our hotel is just minutes from this 140-acre park and home to animals such as chimpanzees, a Komodo dragon and a lion. The zoo includes an aquarium, sting ray touch pool and an aviary.